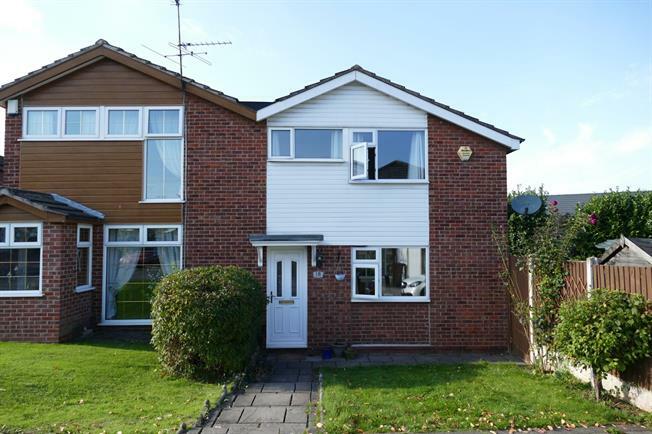 3 Bedroom Semi Detached House For Sale in Nottingham for Asking Price £179,950. A stunning three bedroom semi-detached family home located on a corner plot in a cul-de-sac which is in fantastic condition. The property benefits from a reception room, modern kitchen-diner and conservatory downstairs with three bedrooms and a four piece bathroom suite upstairs. Outside the property benefits from well kept gardens front, rear and side with a large driveway fir several cars and garage. Viewings come highly recommendable. Double glazing UPVC window, Radiator. Providing access to kitchen-diner to rear. UPVC French double glazed door. Double glazed UPVC window. Radiator, tiled flooring. Roll top work surface, built-in units, single sink with drainer, electric oven, gas hob. UPVC double glazed door, opening onto the garden. Double glazed UPVC window with frosted glass. Heated towel rail, tiled flooring. Standard WC, corner bath, electric shower, pedestal sink.